For roughly 20 years now, the guitarist Joscho Stephan has been performing as a gypsy swing musician on both a national and international level. Forming a trio with Volker Kamp on the double bass and Sven Jungbeck on the rhythm guitar, he feels himself drawn to the musical legacy of the “Hot Club de France”, the legendary ensemble which Django Reinhardt and Stéphane Grappelli brought to life in the Thirties in Paris. Having made numerous CD productions, it was more or less a matter of course to make a recording under the very same conditions as Django Reinhardt and all renowned swing and jazz musicians had experienced up until the end of the 40s –, namely Direct-to-Disc! The A-side boasts the title “Paris”. Alongside his own compositions ("Train To Paris" and "Valse de la Mer") we find such Django classics as "Are You In The Mood", and the numbers "Songe d’Automne" and "Vous et Moi", which are also evergreens from the gypsy swing genre. The B-side is an homage to the recording location and the recording studio (EBS) which is associated with it: Berlin. Not only are such hits to be heard as "Mein kleiner grüner Kaktus" (as an up-tempo swing number), "Hallo, kleines Fräulein" and "Bei Dir war es immer so schön" (by Theo Mackeben), but also "Kein Schwein ruft mich an" from the great Max Raabe. 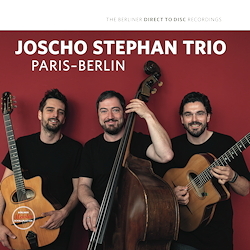 "Wes Berlin" by Joscho Stephan brings the LP to a close in a final bow to Wes Montgomery, ending our journey from Paris to Berlin.